The Center for Mass and Related Quantities in the Korea Research Institute of Standards and Science has developed the world’s first computer mouse that delivers touch information to users. 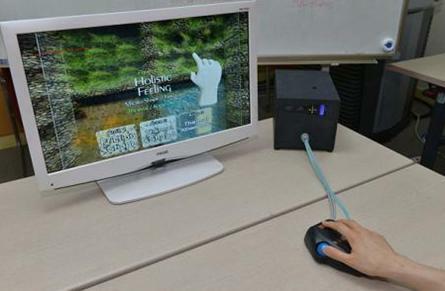 The device allows users to feel coldness and the choppiness of a river on the screen by touching the pad attached to the mouse when they move the cursor to the picture. At the heart of the new technology is a “multi-sense display device,” which provides multiple characteristics of a certain material at once such as friction, intensity, temperature and roughness. Lead researcher Park Yeon-kyu said that when the technology was fully developed customers would be able to feel the texture of products before making online purchases. It would be also theoretically be possible to indirectly touch ancient relics preserved at museums through the mouse, he said. Another obvious application is gaming. “Particularly, the new device will be welcomed by online game players for the vivid effects it can create,” Park said.